looking at the picture, feeling cold, wet, dark and lonely. From the picture, the place seems it is not chew proof. If I am in your shoes, I would not put it there while I am at work. I would put a create nearby the working area (if possible) and let it stay inside for hours, and make a few breaks through the day. Mutual benefit. My husky love stays close with me. Cosmo, mixed emotions here. Like above, it looks wet so I'd want to make sure he has someplace out of the damp. If those are windows about half way up then it should be light enough to give light to play with. If you were to leave her out there, you'd have to make sure she's got at least water and depending on how long you're out maybe some food. I agree with Gizz though, it's not chew proof - expect most of the wood to get chewed if / when she gets bored. Wood chewing, especially treated wood is not a good thing!!! 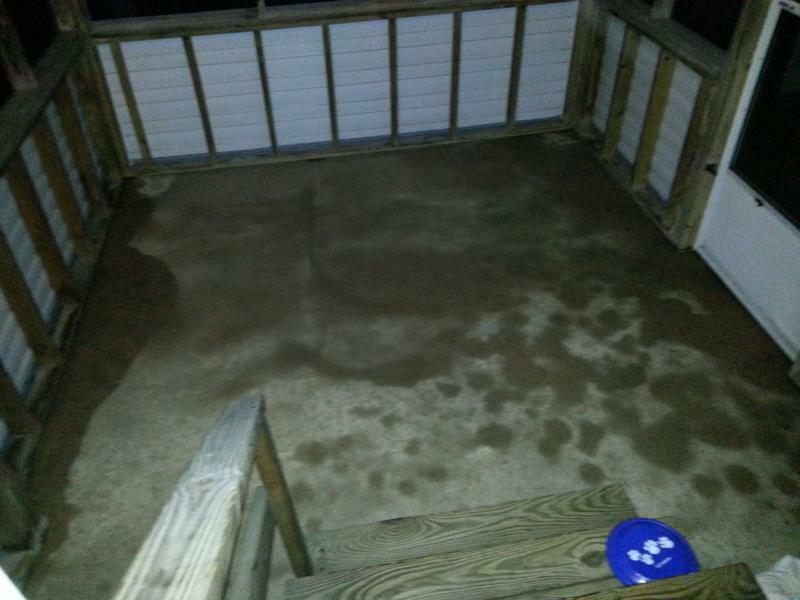 Unsealed concrete does not clean well, it will absorb feces and urine and cause an odor that you may never get out. I agree, crate's probably a better idea. The patio might have a little more room, but with no one to play with, it won't mean much to the dog. Sometimes more space = more loneliness = separation anxiety. Huskies often need to be with people or other dogs to be comfortable. If yours is comfortable with the crate, I wouldn't change it. The crate can be a comfortable, safe little den that the dog can call its own. I never thought it would happen but we recently caught ours going into her crate on her own while we were out of the house. She had the run of two big rooms and chose the comfort of her crate. If it's only for a few hours a day and the dog's getting plenty of exercise and attention otherwise, I'd stick with the crate.